The Arizona Republic news publication received backlash on social media for depicting Rep. Kyrsten Sinema (D., Ariz.) using a rocket launcher to shoot her Senate opponent, Republican Rep. Martha McSally (Ariz.), down in a plane. Sinema, who is a former anti-war activist, is shown holding a rocket launcher with the word "substance"on it and giving a thumbs up. On the right side of the cartoon, there is a plane going down with the words "shallow attacks" written in the black smoke. The plane has "McSally" written on it, referring to Sinema's opponent, who was the first woman in U.S. history to fly a fighter jet in combat and the first to command a fighter squadron. The words "reason not treason" are at the bottom of the cartoon. "Arizona Republic editorial cartoonist Steve Benson on the McSally vs. Sinema #AZSEN race," tweeted Arizona Republic's national politics editor Dan Nowicki along with an image of the cartoon. The cartoon is in response to their debate earlier this week, where Sinema dodged a question about her past comments, including a 2003 interview where she said she doesn't "care" if Americans go overseas and fight for the Taliban. "CNN reported that in 2003 while she was on the radio, you said it was okay for Americans to join the Taliban to fight against us," McSally said. "You said you had no problem with that. Kyrsten, I want to ask you right now whether you are going to apologize to the veterans and me for saying it's OK to commit treason." Sinema dodged the question and attempted to shift the conversation to negative campaign tactics, saying McSally was "engaging in ridiculous attacks." 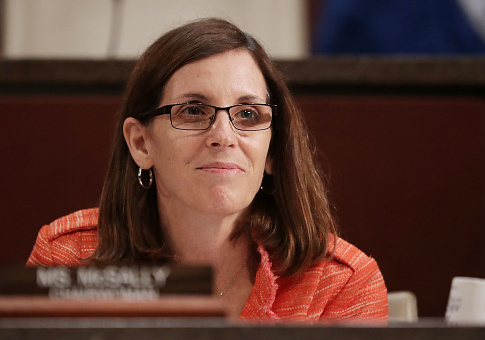 "It's treason and she also called us ‘crazy' here in Arizona," said McSally, referring to a 2011 speech in Texas where Sinema said Arizonans were "crazy." McSally and Sinema are competing to fill the Senate seat currently held by Sen. Jeff Flake (R., Ariz.), who announced last year he wasn't running for re-election. This entry was posted in Politics and tagged Arizona, Kyrsten Sinema, Martha McSally, Military. Bookmark the permalink.